1. Turn the ignition switch and all other switches off. 2. Remove the fuse panel cover by pressing the tab and pulling the cover up. 3. Check the removed fuse; replace it if it is blown. 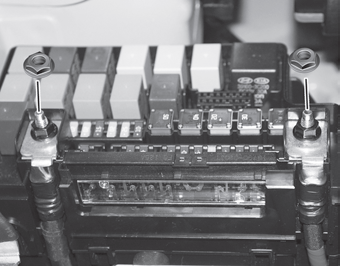 To remove or insert the fuse, use the fuse puller in the engine compartment fuse panel. 4. Push in a new fuse of the same rating, and make sure it fits tightly in the clips. If it fits loosely, consult an authorized Kia dealer. 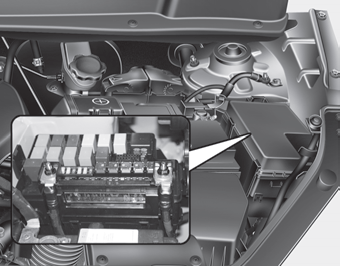 After checking the fuse panel in the engine compartment, securely install the fuse panel cover to prevent electrical failures which may occur from water contact. 3. Remove the fuse panel on the right side in the engine compartment. 4. Remove the nuts shown in the picture above. 5. Replace the fuse with a new one of the same rating. 6. Reinstall in the reverse order of removal. If the multi fuse is blown, consult an authorized Kia dealer.